We forget that sometimes. When it comes to our Denver community, homelessness and the brink of homelessness due to rent and home prices is an everyday reality. Yet, many people pretend these issues or people don’t exist, pushing them into corners (literal corners, like Lawrence Street and Park Avenue and figurative corners, like not being able to get credit, rent a place, find a job, etc.). This is our call to open our community, minds and hearts. We’re all on the same team. The foundation of Maslow’s hierarchy of human needs is shelter. We need a place to rest and protect ourselves from the elements. Without that support, there’s not much to build on. Local Denver shelters are crowded, many are completely full daily. The silver lining is that there are so many dedicated people, organizations and businesses that understand we are all part of the same community and want to help. Yet, it’s true… housing, especially in Denver, is a luxury. It can be mind numbing to think about… Did you buy your home before the Denver market boom and are lapping up your property values this year? Or, are you looking to buy and have been saving for some time, concerned about the prices out there? Finally, you could be like the best friend of a Conscious Real Estate employee… renting a studio for $1700 and sharing it with your partner. These are the common scenarios in housing these days. While more affordable housing is going up and some really cool projects like the Beloved Community Village have been changing the scene, donations are needed to help more people. And, also… check this out. This stand-up judge is currently refusing to drop a class-action suit against the city of Denver for confiscating the property of homeless people (remember those awful vides of law enforcement taking their blankets on Capitol Hill last winter in the snow?) This is the kind of positive, for-the-people government action we like to see. We’re coming together!! Many of our homeless neighbors are vets coping with trauma. Many have been homeless since they were kids. One man was literally thrown from a bridge. Another was just an infant when he became homeless. Their stories show just how strong human resilience can be despite the circumstances. This inner strength is, well, awesome. A lot of stories start out like any other. Bruce, for example, was a marine who made it big during the dot.com era. He was making six figures, was married and living a family life when everything came crashing down. The money ran out after the bubble. His wife divorced him. He lost contact with his son. He began to drink, heavily. Life spiraled out of control. His drinking left him physically disabled, having to use a cane to walk. Two toddlers, Caden & Ria, became homeless when their family was evicted from their apartment (for reasons that are not mentioned on the site, but with the prices in the Denver area, we can only imagine…). Due to this hardship, the family was not able to maintain requirements for the Colorado Childcare Assistance Program (CCAP) Subsidy and they stopped bringing the kids to school. This was especially alarming as Caden tests on the autism spectrum. After learning about the circumstances, through the Colorado Coalition of the Homeless, the family learned about programming that would allow the children to continue to come to school, getting much needed nutrition and support. The family also received help on career assistance and finding a home. Through the organization, the family now is employed and living in an apartment. Jessica went through what no mom should ever have to. She lost her three month old to SIDS (Sudden Infant Death Syndrome.) Devastated and still caring for her other children, a series of events led to her dismissal from work and then eviction from her home. She lived with her mother in a small mobile home, but was targeted as at-risk of losing custody of her children unless they found a more stable environment. Through the Colorado Coalition of the Homeless, Jessica was able to go through the Family Reunification Program and helped her move into a suitable home with her children. She is also now able to regularly meet with a trauma counselor to work through the grief over the loss of her child. She plans on working in the medical field and works every day to make a better life for her children. …read more incredible stories here. What this donation means to us. Getting past all the odds. 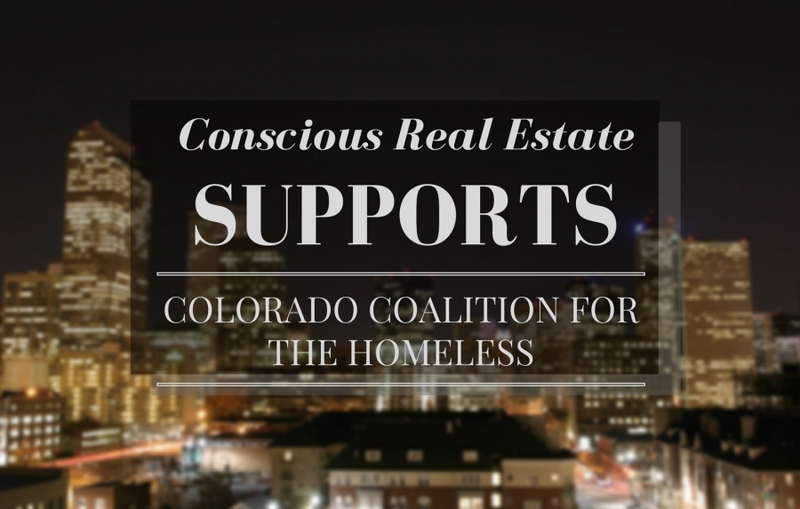 Nonprofits like Colorado Coalition for the Homeless exist because homelessness may never be solved. Donations help give much needed funding to a nonprofit that needs staff, shelter maintenance, outreach, medical assistance, financial coaching and the many other services they offer. We have been donating to the nonprofits of our clients’ choosing for over four years now. We have no regrets about the many wonderful organizations that our clients have selected to receive donations. This is exactly why we created our business model as such – we care about all of the causes. The environment matters. Free speech matters. Veterans matter. Social justice matters. Animals matter. ALL OF IT MATTERS. But still… four years is a long time to go without donating to a group of people who we all see on the streets every day in Denver – a group of people who are clearly in need. This donation landed an extra special place in our hearts… why shouldn’t the donations from our home sales contribute to the homeless? From the start, Conscious Real Estate always had a socially conscious mission. Since the beginning, we have donated to scores of global, national, local and hyper-local nonprofits. 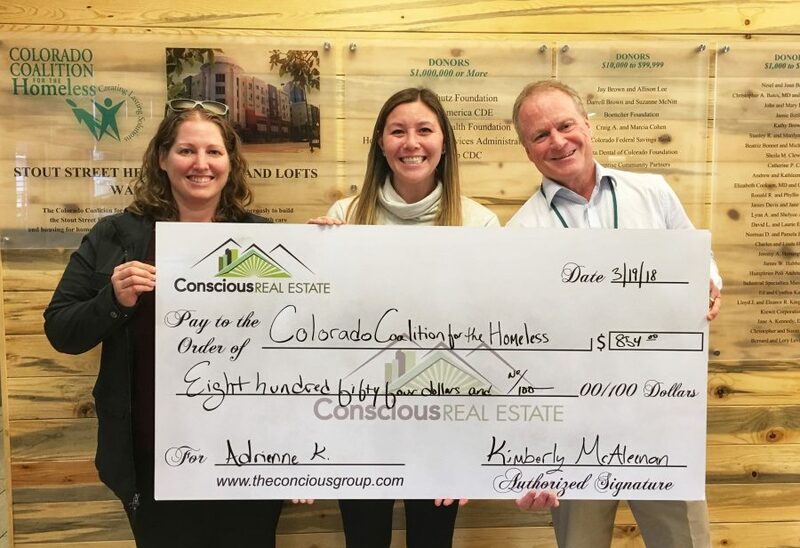 We love focusing on Colorado nonprofits and this donation was especially meaningful. 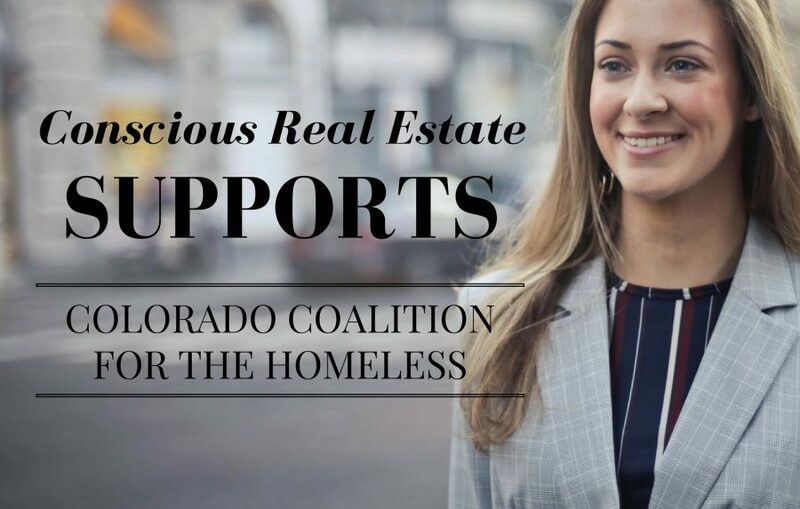 We genuinely hope to generate more business that allows us to continue to give back to the Colorado Coalition for the Homeless. Here is Conscious Real Estate Agent, Kimberly McAleenan (center), with her client Adrienne (left), and John Mezger (right) of the Colorado Coalition of the Homeless. Let’s just say those smiles are thinking about what can be done with $854! A lot!!! Are you looking to buy or sell? Join the conscious movement and contact us to learn more. When you buy or sell a home with Conscious Real Estate, you’re able to donate a large chunk to a nonprofit of your choice. So many of our clients already make smaller monthly donations and attend the events of the organizations that they love, but this really allows our clients to give in a bigger way – using our money.